We only got to spend 1 night in Krakow on our family trip to Europe in 2013 but what a night!! Krakow had been on our must-see list for some time. It always looked so amazing in the pictures you would see. There always seemed to be many things to do in Krakow. For us to explore the royal side of Krakow at Wawel Castle was going to be a highlight of a visit Krakow trip. We flew in early in the morning from Berlin to meet up with our Polish and German friends who were meeting us at John Paul II International Airport Kraków–Balice. Krakow airport is located only 11 kilometres from Krakow city centre. Check current PRICES for a great stay at the Dragon! As travellers, Rebecca and I love castles and seek them out where ever we go. Not sure why maybe it is because we are Australian and no such castles exist in Australia. It’s the size, the design, the opulence and the history that’s associated with these magnificent buildings. I must admit to showing some ignorance about Krakow. I did know what to do in Krakow southern Poland for that matter. All I knew was that the pictures we had seen looked amazing. I knew we were meeting friends who were well aware of the sights of this region. They would show us what to do in Krakow. We just assumed they would take us to the worthy kraków points of interest and tell us about the history that they had learned. Sometimes this is the best way, to leave it in the hands of those who know and live there to show you Krakow attractions. You get a more realistic view and experience of these places. It is even more interesting when you put another person’s view and experiences into it. If you don’t want to go it alone there are many Krakow tours that will show you the city and surrounds. Sometimes this is the best way, to leave it in the hands of those who know and live there to show you Krakow attractions. You get a more realistic view and experience of these places. It is even more interesting when you put another person’s view and experiences into it. If you don’t want to go it alone there are many Krakow tours that will show you the city and surrounds. The next day before leaving for Istebna in Poland we toured the Wawel Castle complex. It sits at the end of the Krakow old town district. The Royal Road as its called enters Krakow old town at The Gothic-style Barbakan through St Florian’s Gate. The Barbican was constructed in 1499, is one of only three such fortified outposts still surviving in Europe. St Florian Gate is at the Northern end of the old town. The Royal Road crosses through the Matejko Square or market square in English. Main Square (Rynek Główny), the largest medieval market square in Europe. Some of the features of market square include St. Mary’s Basilica, home of the oldest and the largest Gothic altarpiece in the world. What makes this Square unique is that in the centre of the square you will find the Renaissance cloth hall. The Royal Road in Krakow continues along Grodzka Street ending at the foot of the Wawel Hill. 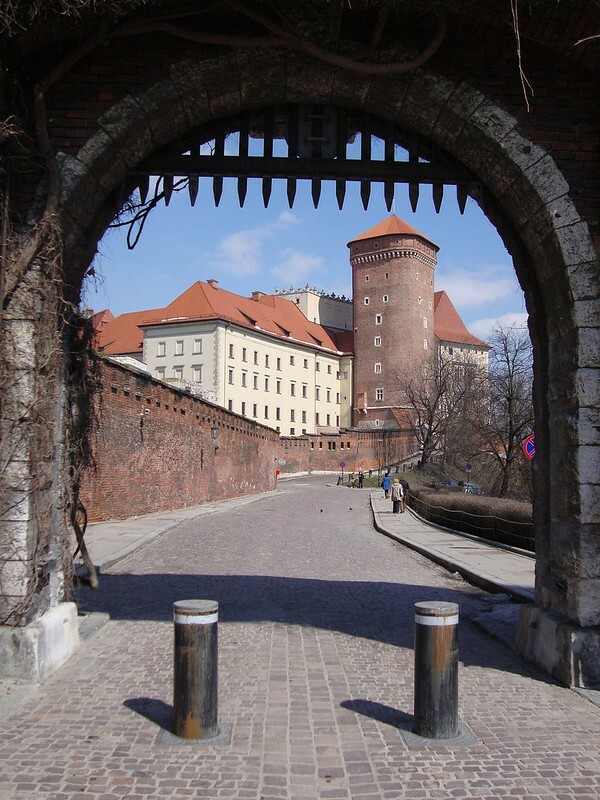 The Wawel castle and its featured armoury and dragon now await your exploration. The Gothic Wawel Castle in Krakow in Poland was built from 1333 to 1370. The Wawel complex consists of a number of structures situated around the central courtyard. “The Wawel Royal Castle and the Wawel Hill constitute the most historically and culturally important site in Poland. For centuries, this was the residence of the kings of Poland. It was a symbol of Polish statehood and Power. The Castle is now one of the country’s premier art museums and UNESCO World Heritage Site. The Krakow hop on hop off bus tour includes a stop a Wawel castle. See the sights of Krakow at your own pace from the top deck of a double-decker, hop-on-hop-off sightseeing bus. Choose a 24-hour or 48-hour ticket to acquaint yourself with the city, and marvel at monuments such as Sukiennice Cloth Hall. There are many buildings on site including the Wawel Cathedral, the crown jewels and the armoury. The two most important objects include the SZCZERBIEC – coronation sword of Polish kings. It was constructed sometime in the mid 12th century. It was used in Wawel as a coronation sword for Polish kings until it was looted and eventually turned up at the Hermitage Museum in St Peterburg. From the Hermitage, it was transferred back to Wawel. The second item KING SIGISMUND I THE OLD’S SWORD was used as a sword of justice. It was kept in the treasury till it was also looted. In 1951 the sword appeared for auction where it was bought by some patriotic Poles and donated back to Wawel castle. The Wawel Cathedral dates back over 900 years. The cathedral that you visit today is the third version on this site. Like most constructions medieval Europe, it has been built and destroyed throughout history. The Wawel Cathedral was constructed and destroyed in the 11th century. A second Wawel Cathedral constructed in the 12th century was destroyed by a fire in 1305.The construction of the current Cathedral took place in the 14th century and has lasted the test of time. The Cathedral’s history is intertwined with those of the Polish royalty that made Wawel castle home. It is a Polish national sanctuary and site of many Royal Coronations. A young Karol Wojtyla who went on to be Pope John Paul 11 has a strong association with the Wawel Cathedral. He offered his first Mass as a priest in this church in 1946. The construction of the current Cathedral took place in the 14th century and has lasted the test of time. The Cathedral’s history is intertwined with those of the Polish royalty that made Wawel castle home. It is a Polish national sanctuary and site of many Royal Coronations. A young Karol Wojtyla who went on to be Pope John Paul 11 has a strong association with the Wawel Cathedral. He offered his first Mass as a priest in this church in 1946. At Wawel castle, we found the armoury and the jewel exhibitions quite interesting. In the armoury, dozens of different swords were on display. The weapons represented different eras of Polish warfare and combat. This amazing collection the weapons used defending the Polish nation and people throughout history. The presentation only displays a small amount of what was once the collection. In 1795 the Prussians broke into the treasury and almost destroyed the whole collection. Discover Poland’s past and present as you walk along the medieval Royal Route of Krakow’s Old Town. Experience a taste of local culture while strolling through the largest square in Europe, visiting the Barbican outpost, and exploring Wawel Royal Castle. For the LATEST prices on this amazing tour click this button! There is a nice cafe on site. We had coffee and cakes and soaked up our amazing surrounds. If you get a good table you can look straight at the castle while enjoying a break. Room 2 of the collection which contained many full suits of Amour was favourite among our kids. Mike the Knight the Tv show was mentioned more than once in reference. Room 4 full of spears and hand to hand weaponry was my favourite. Combat must have savage back in the Medieval times. There is also a legend about a dragon associated with Wawel Castle. There is a cave at the bottom of the hill that is referred to as the “The Dragons Den”. The oldest known version or first written mention of this Dragon of Wawel was in the 13th century in relation to the mythical beginning of Krakow. A popular version of the Wawel Dragon tale takes place in Kraków during the reign of King Krakus, the city’s legendary founder. Each day the evil dragon would beat a path of destruction across the countryside, killing the civilians, pillaging their homes and devouring their livestock. In many versions of the story, the dragon especially enjoyed eating young maidens, and could only be appeased if the townsfolk left a young girl in front of its cave once a month. The King certainly wanted to put a stop to the dragon, but his bravest knights fell to its fiery breath. In the versions involving the sacrifice of young girls, every girl in the city was eventually sacrificed except one, the King’s daughter Wanda. In desperation, the King promised his beautiful daughter’s hand in marriage to anyone who could defeat the dragon. Great warriors from near and far fought for the prize and failed. One day a poor cobbler‘s apprentice named Skuba accepted the challenge. He stuffed a lamb with sulphur and set it outside the dragon’s cave. The dragon ate it and soon became incredibly thirsty. He turned to the Vistula River for relief and drank and drank. But no amount of water could quench his aching stomach, and after swelling up from drinking half the Vistula river, he exploded. Skuba married the King’s daughter as promised, and they lived happily ever after. I must say up till this point my 2 daughters had been little brats with lots of moaning and complaining and not listening to their parents, as kids do. They sure perked up once they found out there is a dragon’s cave that you can venture into. I think they were half expecting the dragon to still be there. A trip into the dragon’s cave Wawel Castle begins at the foot of the Thieves Tower where you need to descend down a staircase into the cave. The thieves tower was once an Austrian well. The cave is series of limestone rooms that were at one stage in the medieval era used as everything from a tavern to a brothel it is told. The cave is 270 meters long but only 81 meters is open to the public to view. When you exit the cave there is a sculpture of the Krakow Dragon that breathes fire every few minutes. My daughters loved this part for sure. The Wawel Castle Dragon was certainly the kids favourite part of this visit. If I had of know earlier I would have been telling them to behave or no Wawel dragon lol! There is a nice walk along the river back to the car park or public transport from here. Wawel castle / Castillo de Wawel one of the many things to do Krakow . Krakow Airport is served by two regular bus lines: 208 and 252 and one-night line: 902. Hostels in Krakow can start from as little as 6€ Euro a night for a shared dorm room. Hotels in Krakow generally start from around $73.00 a night for a double room 3star and increase incrementally as the luxury rating rises towards the 5-star average price of $156.00. Thanks for taking the time to post a comment we appreciate. The dragons den is amazing and a great way to finish your visit to Wawel castle. have you been to Krakow before? This brings back both good and bad memories… Amazing place to visit but I remember having a knee injury that made walking so painful I had to miss some parts of the castle. Good thing we are headed back next year to Poland.